Video games are often controversial enough, especially when parents worry that their kids are getting negatively influenced by games. 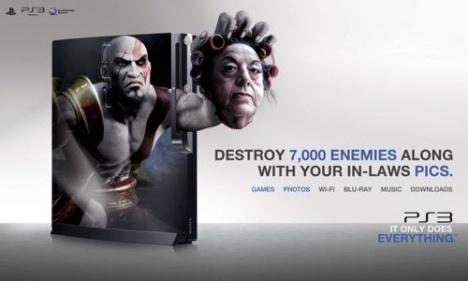 So with these latest PS3 ads showing pictures of “your in-laws” heads, it’ll certainly have alarm bells ringing in many parents’ heads. That’s not even taking into account the other pictures that seemly suggest you to two time your girlfriend. Whatever the case, if it causes a storm of complaints, you can be sure that the PS3 will be getting plenty of exposure, though we’re not sure if it’ll be negative or positive exposure. LMAO I love this Ad' !! i wish u could change the head lol. id put my great aunt she annoying. ya man i cant wait its going to be awesome.